This huge crate's assortment is as classy as the city itself. 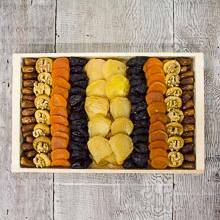 Included are our fancy jumbo pears, black French prunes, fancy Sierra figs, Deglet Noor dates, jumbo apricots, and hand-shelled walnuts. Enjoy! Net Wt. 112 oz. Ship Wt. 10 lbs.